All proceeds go toward missions in Barrow, Alaska A Sterling Silver and 14k gold artist wire bracelet with glistening Cubic Zirconia. A Sterling Silver and 14k gold artist wire bracelet with glistening Cubic Zirconia. 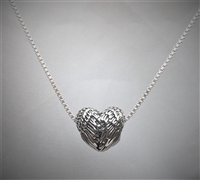 14k artist wire bracelet with a hand sculpted sterling silver heart enclosing an infinity... Forever in Love A Sterling Silver and 14k gold artist wire bracelet. Named for the song late father-in-law always sang to my daughters. 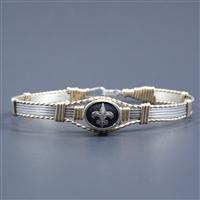 A sterling silver and 14k artist wire bracelet perfect for tailgating parties! Contact us for additional schools. Most Schools ARE available! 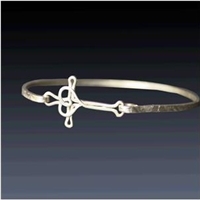 A Sterling Silver and 14k gold artist wire bracelet. Named for the song late father-in-law always sang to my daughters. A Sterling Silver and 14k gold artist wire bracelet with glistening Cubic Zirconia.